n February, 1999 Meisha Merlin Publishing, Inc. released Plan B, a new Liaden Universe® novel. With that publication Sharon Lee and Steve Miller began experiencing a very rare phenomenon in publishing -- the resurrection of their science fiction series. The Liaden Universe® books were originally released back in the 1980's, but the original publisher dropped the series after the first three books. Now, a decade and a half later, the books are back in print, selling well, and new Liaden Universe® stories are winning awards. At this year's Romance Writers of America (RWA) National Conference in Denver, the 2002 Prism Award winners for science fiction and fantasy romance novels went to Scout's Progress (First Place) and Local Custom (Second Place). Vision: Your books went out of print for some time and have now not only comeback under several publishers (including some ebook editions), but have drawn considerable attention and awards. What do you think has changed in the market that allowed this comeback? SHARON: Nostalgia. A need for closure. The people who started reading our books with the Del Rey edition of Agent of Change, back in nineteen-aught-eighty-eight, wanted to know What Happened after Carpe Diem. We are fortunate in that many of those people – our fans – are (1) resourceful and (2) well-connected. It's largely due to their efforts that the Liaden Universe® is back in print – they served as a cheering section, support group, and idea farm. The fact that we are – this time – reaching a wider audience is in part, I think, due to the fact that there is a sizeable segment of Romance readers who are looking for 'paranormal' or 'futuristic' elements in their Romance. The Liaden stories satisfy their need for stories containing a committed romantic relationship while embracing the weird wonderfulness of SF/F. STEVE: I’m not sure that everything that happened along the way was market driven; certainly there could have been some 'not invented by me' going on there at our original publishing house. Then, of course, was the problem of the marketing department. We had several editors interested in publishing more of the Liaden books, but they’d run the idea by the marketing department, and the marketing department would – to a soul – fall on their swords rather than reprint what they called a 'broken series'. What finally happened, of course, was that we came to the attention of publishers who were their own editors and who also were their own marketing department, and who were enthusiastic about our work. Once Meisha Merlin had 'proved' that the books were marketable, then Ace was willing to go with mass market reprints. Vision: The two of you have formed a very successful writing team. Are there any ground rules you can suggest for people considering writing collaborations? STEVE: This is definitely a 'how we do it' question – we can’t promise everyone can collaborate on a whim. I think, first, you need to have some experience writing (and publishing!) on your own before you get into collaboration. Real editing experience – doing production editing and being edited on a production basis – is also a useful pre-qualifier. After that I think it’s important to be clear about how you both see what you’re doing. I’ve seen, and am aware of, a number of collaborations done on a 'senior writer/junior writer' split (which I don’t advocate, but hey, if it works) but if that’s what you’re doing, then be aware of it to start. Be sure you both agree on who the junior writer is if you’re doing it that way! SHARON: First, have rules. Know that when your writing partner says, "This is first draft," that this means they are looking for general comments on the direction the story is taking, not a detailed critique of sentence structure. Aside from that – be willing to brainstorm, to sound foolish and to take risks. That means trusting your partner's instincts – and your own. Vision: Is there any set sequence to how the two of you work together when creating a new story? Do you each have favorite areas that you each like to handle? SHARON: We once revealed at a convention that Steve did the space battles and I did the knife fights. I got a lot of respect at that con. STEVE: The only set sequence is that we talk a lot about the story and the characters before we start and after we start. I tend to get the astronomy stuff, I guess, and I also get the aircraft/spacecraft operating stuff. Despite people’s expectations we both know and work with knives and guns, so either one of us will do that kind of weapons stuff. I do tend to get the heavy weapons stuff, too, but that’s because Sharon never had a chance to fire a machine gun or handle a shoulder launched anti-armor missile. If we’re in first draft mode, Sharon tends to get a lot of that – she types faster and (sigh) more accurately. Whoever feels like they have an edge on a part of the story is encouraged to go ahead and get it done. Vision: I know that Sharon has a mystery novel, Barnburner, available. Do you often write individual pieces? STEVE: We started out writing individually, after all, and we sometimes have visions – excuse me – ideas! – that really aren’t as suited to the give-and-take of collaboration. As to often? Well, we’ve been pretty busy with the shared stuff, so not nearly as often as we used to. SHARON: We both do singleton projects. The trick is finding the time to work on them, with collaborative novels scheduled through 2006. For instance, I'd like to get a little time to finish up Gun Shy, the sequel to Barnburner. Maybe this summer. Vision: You have a number of very popular characters from the Clan Korval. Are there some hints you can give new writers to help them create the qualities needed for memorable characters? SHARON: They're not characters, they're real people. And like all real people, they have goals, and plans, secret sorrows, joys, disappointments and triumphs. I don't have the feeling so much of 'creating' memorable characters as I do of listening to friends tell me about themselves. Some writers have an excess of plot, and there is the temptation to force characters to do certain things simply to satisfy the Ghods of Plot. Resist this temptation. A writer will hardly ever go wrong by listening to her characters. STEVE: It'd take a book – and I’m going to write a book (well, at least a chapbook) about characterization someday soon. The real key is to see and treat your characters as people. If you write a 'spear carrier' or 'red-shirt' you and your (other) characters won't deal properly with them and your readers will catch on real soon, too. I should mention that I'm not much of a fan of the 'complete biography including what they had for breakfast on their fifth birthday' kind of character building – in most cases it's a waste of time, unless that fifth birthday was a pivotal day. Rather, pick a few broad traits to begin with and fill them in as you go along – just the way you'd fill them in if you were meeting a new person, and then going to dinner or seeing him at the ball game or whatever. That way you don't get prepackaged 'character 5' in everything you write. Vision: In the back of Plan B you say that during the years when the books were not in print, you wrote Liaden Universe® stories for yourselves. Is there any difference in your approach now that you are writing them for print again? STEVE: I can't say there's all that much difference in approach. We still brainstorm at the kitchen table after dinner, and we still brainstorm in long drives around the state, or when we're traveling to conventions. Of course having a deadline tends to keep us on task, but many of the story elements we're using now are things that were brain-stormed years ago. It helps to have so much of a pre-drawn, pre-discussed background to work from. SHARON: A trick question! Since we write character-driven fiction, we are at bottom concerned with getting the characters' story right – whether we're writing for 'ourselves' or 'for publication.' I will say that, left to my own devices, I tend to dawdle in my writing, and that having books under contract forces me to focus – and to write quicker. Vision: You have created a complex universe for Clan Korval. Did you intend that from the start, or has the depth grown and surprised you as you worked along. Any pointers for people creating a story universe where the writer intends to place several stories? SHARON: Well... yes and no. When we were writing Agent of Change we wanted the Liaden culture to look Byzantine and dangerous to poor ol' simple Terrans. I don't think either one of us really understood how Byzantine and dangerous it really was until some time during the first draft of Local Custom. STEVE: I think we did intend (and hope for!) a complex universe, simply given the scope of the books and stories we knew we wanted to write from the first night we worked on Agent of Change together. Certainly the depth has grown far beyond what we initially envisioned – but we’d never written a seven book series with a three or five book follow-on before. Pointers? That’s hard. I'd guess the first thing is to not make your universe too small, or too limited – don't do an 'all the worlds of the universe were governed by King Flatula' in the first book if you might need an independent world in the second book. In part this means you've also got to specify in some way that your characters have limitations, that they can't get at all the information they want at all times. That way if you need a new world, or a new galaxy, you’re not constrained. Also, recall what Lois McMaster Bujold has said on a similar topic – the author is permitted a better idea. So if you desperately need something you hadn't counted on, use it neatly, but use it. Vision: You've had very loyal following for years, even when your books were not readily available. Does the new fame of the Liaden Universe® books surprise you? STEVE: 'Fame' is such a loaded word, isn't it? I think we hoped for, and perhaps anticipated the – let's call it popularity rather than fame, shall we? – new popularity of the books, because we'd seen signs that the series had that potential from early on. At one point quite soon after Carpe Diem (the third book in the series) came out enough people were asking 'When is the next book in the Liaden Universe® coming out' that it made the rec.arts.sf.writen FAQ. That, and the information from within Del Rey that the same question was – for about three years – the most frequent question they got in email from readers. But I think we knew that something good was up when we got to BucConneer (the WorldCon in Baltimore in 1998) and had a signing – and were amazed to find that we had dozens of people in line and hadn't had a book out in years. Then, when we got to the west coast as Guests of Honor for SiliCon in November of that year we also signed dozens and dozens of books. So we had an inkling that – if we could get the books out – they'd do OK. So I think we're pleased, and happy, but not altogether surprised. SHARON: I'm surprised that they're doing as well as they are (this is not a complaint), because the Liaden books are none of the things that we are all told will sell. They're not cutting edge. They're not tech-driven. They're a little sweet and old fashioned. They talk about family values, about loyalty, and about True Love. Vision: Your books seem to draw science fiction, fantasy and romance readers. Did any of these groups come as a surprise to you? What do you have to offer to each one? SHARON: I was ...interested to find that the romance readers stuck with us; I thought the greater emphasis on action-adventure in some of the books would lose their interest. They're tougher than I thought. For romance readers, we offer strong relationships and stories of partners working together. For fantasy readers, we offer (as one critic said, in complaint) a fantasy feel, plus wizards, sentient trees (why are sentient trees fantasy? she wonders), and a story line that is somewhat quest-like. For science fiction readers – space battles, world building, and sensawonda. STEVE: I guess I was surprised at the good reactions we got from the reviewers at Romantic Times in the late 80s, but part of that was because I simply didn't know the magazine existed. Otherwise, no, not too surprised since we both read all those genres and tend not to see them as tightly bordered as some readers, writers, or editors do. I think what we have to offer all of them is a decent story with characters they can care about. Vision: Who have been your writing influences and how have they helped your work? Who do you currently like to read? STEVE: Oddly, perhaps, I think I have to go back to a lot of the writers I read when I was young. Walter Farley (Black Stallion series), Jim Kjelgaard (Big Red, Irish Red, Wild Trek, and many etc), Andre Norton, Robert Heinlein... and Jules Verne. Overall, what they gave me was a sense of adventure pacing. Later, of course, I got into Bradbury and Clarke and the harder stuff, and then widened my horizons to mysteries and to the regency romances of Georgette Heyer. However, the sense of wonder and adventure – a feel that reading should be fun and interesting rather than work and boring – that’s what helped me get me started as a writer, I think, and what keeps me reading today. Today I like to read Sharon Lee (Really! ), and C.J. Cherryh when I can, and I’ve liked what I’ve seen of Laura Underwood’s work. I also read nonfiction about railroads and astronomy magazines and books and – but see, right now my time is constrained somewhat by our writing schedule. I can’t do the book-a-day every day trick I did when I was in high school and college. SHARON: Anne McCaffrey, Andre Norton, Dorothy Sayers, Dorothy Eden, Mary Stewart, Frank Yerby, Samuel Schellabarger, Georgette Heyer, Rex Stout, C.J. Cherryh, Ray Bradbury, Agatha Christie, James Schmitz, Flann O'Brien, Jane Austen, Sarah Caudwell, Laura Kinsale, Lawrence Block.... This is getting silly, you know. Vision: Tell us about The Friends of the Liaden Universe®. SHARON: The Friends of Liad are a self-selected and self-described group of Liaden Universe® readers who have banded together to form an online – and occasionally offline – community of like-minded people. It's been a privilege to watch this group gain cohesion, and grow into something far larger than any of its parts. STEVE: The Friends of Liad is a group of Liaden Universe® readers who found out that they tend to have more than the Liaden Universe® stories in common. They get together online at the Liaden Universe® mailing list, and they also get together at conventions when they can. If enough get together at the same convention they’ll put on a Liaden Lounge so that more fans and friends can come on by. It was the Friends of Liad who encouraged us to publish Two Tales of Korval in 1995, and who have helped support almost all of our publishing efforts since then as well. Vision: You attend many conventions and will be Guests of honor at MarsCon in Minneapolis at the end of February and BaltiCon in Baltimore over Memorial Day Weekend. Does attending conventions help your book sales, or is it just fun to be part of fandom? Or both? SHARON: Um. Attending conventions does help our book sales and it's certainly fun to be part of fandom. 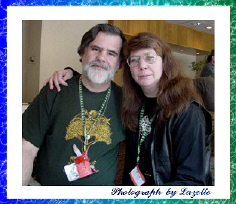 My first convention was a BaltiCon, 'way back in 1976, and for a few years Steve and I traveled to cons as book dealers and art agents. We have a lot of friends in various portions of fandom, and it's nice for us all to meet on common ground. Because we have been part of the community for so many years – yes, attending conventions does help our book sales. I really don't know if that would be the case for brand-new, just-starting-out writers. I would tend to think that attending conventions wouldn't help sales, just at first, but that, over time – it might. That said, I think cons ought to be attended for the fun of the thing, first. If a new writer has tried a couple of cons and is just miserable, then they should certainly not force themselves to attend more. There's enough misery in this life without deliberately manufacturing more. STEVE: We do enjoy going to conventions, and we consider ourselves part of fandom, and from time to time manage to just go to a con for fun – that is, without being on the programming. Still, from the practical side, yes, going to conventions helps us sell books. For one thing, we get a chance to talk to editors at some cons – and that has been fruitful for us, both in short story gigs and in longer work. Also, we get to meet readers in person – at parties, at readings and autograph sessions – and it seems like that has helped some readers take the plunge and buy a book – or six or seven. On top of that, we get to be on panels at a lot of conventions, and there’s another chance for people who are unfamiliar with our work to decide they need to read us, and to remind people who've read us already that it's time to read another book or story. Vision: Sharon Lee is now President of SFWA. New writers have many misconceptions about SFWA. Would you like to give us just a short idea of what SFWA does for genre writers? SHARON: At its best, SFWA functions as an information-sharing service. Much of that information, particularly regarding scams aimed at writers, and Internet piracy, is available to all, through the SFWA website (www.sfwa.org). SFWA has also worked, behind the scenes, to encourage publishers to pay royalties, and also to regularize certain accounting practices having to do with overseas sales. These are things that benefit not only SFWA members, but everyone writing in the genre. From my stint as executive director, I know that some new writers see SFWA as ...a validation that they are Really Writers. This really gives too much significance to the organization. SFWA is a professional organization, with membership requirements and by-laws, election rules and procedures for recommending works for the Nebula Award®. It's not a validation service. The only person qualified to validate someone as a Real Writer – is the writer him or herself. Vision: The two of you are also editors and publishers. How does it feel to be on the other side of the table, and has it given you a different perspective on the publishing industry? STEVE: Oddly enough, I think it just feels like part of the same thing we do everyday -- but then both of us have a background in working with newspapers – daily, weekly, and monthly -- and we've both been involved with other kinds of publishing. I hope it helps us treat people with a more even hand than we've seen from some editors -- but otherwise, it’s just part of what we do. SHARON: Both Steve and I have worked as newspaper editors, so we were pretty well prepared for the editorial tasks attending, say, the Low Port project we just turned in. The bit I wasn't prepared for was the fact that we would have to turn back stories that we really liked, simply for lack of space. Vision: Any other suggestions you can give to new writers? SHARON: I'll pass on the advice I received from Alexei Panshin, twenty-five years ago: Don't quit your day job. The fact that I didn't take it doesn't make this advice any less excellent. STEVE: First, keep writing. Second, understand that the magic key some new writers look for, the secret handshake, doesn't really exist. Publishing is a community, and if you are around the community long enough you'll meet people who need a story or a novel and who will mention it to you, and if that looks like magic from the outside what it is from the inside is just time-in-grade. It's trust. It's recognition. Some writers never need that kind of break, because their first novel makes millions and they're set for life. Don't wait for that to happen. Get an edge up on the lazy writers and the navel-gazers. Learn to write reasonably quickly and turn in a very clean manuscript. If the magic key does exist it's being able to deliver, on time and with a minimum of fuss. The easier you make it for an editor to work with you (without being taken advantage of) the more work you’ll have. Excuses aren't publishable in the same way that manuscripts are. Vision: Anything else that you'd like to add? STEVE and SHARON: Only our thanks for giving us this forum and a hope that what we’ve said will help energize someone into getting something published. Information on the books by Sharon Lee and Steve Miller, including a Liaden/Terran dictionary and other story-related subject matter, can be found at http://www.korval.com/. They will also be Guests of honor at MarsCon in Minneapolis at the end of February and BaltiCon in Baltimore over Memorial Day Weekend.